Well - yes! Maybe not so much as previously, but still...and my family always says 'not very Buddhist of you' whenever I do, which makes it even more annoying. Although I have noticed that there is a definite increase in equanimity from meditation practice. So I will still get annoyed by traffic incidents and things, but I don't have that kind of formless "bad temper" that I used to have frequently earlier in life. Generally speaking there is more equanimity, but I don't know how it would hold up if there was a big drama. jeeprs wrote: Generally speaking there is more equanimity, but I don't know how it would hold up if there was a big drama. Oh, I still get angry but not so much in the 'instantly erupting volcano' kind of way that i used to. Now I just swear alot (to myself) and get over it. My inability to communicate with myself and others was one of the number one reasons why I lost my temper, a big cause of my rage. I was raised to be seen and not heard, school we had to sit still and memorize for tests. If I spoke out about what I thought I usually was made fun of or I got in trouble or was told to be quiet. I think that was like putting a lid on a jar of food and letting it sit in the sun. I had a really hard time writing and speaking. Once I started meditation in my 30s I found my ability to communicate improve, plus I started reading all kinds of philosophy, not just Buddhist philosophy. Reading philosophy felt like I was rewiring my brain, it was painful but after awhile really fun and I couldn't read anything else for many years. For a time you couldn't shut me up, I made up for lost time. Now I'm just kind of taking life as it comes without the burden of a bad temper and I can express myself without getting frustrated. Pancapapa is a daughter of a poor man of Benares. Her hands, feet, mouth, eyes and nose were hideous, hence her name (the Five Defects); but her touch was ecstatic. The reason of all this was that in a previous birth she had given clay to a Pacceka Buddha with which to tidy his dwelling, but, on first sight, she had looked angrily at him. One day she happened to touch Baka, king of Benares, and he became infatuated with her. He visited her home in disguise and married her. Later, wishing to make her his chief consort, but fearing the mockery of others because of her ugliness, he devised a plan by which the citizens should become aware of her divine touch. Afterwards, owing to the jealousy of the other queens, she was cast adrift in a vessel and claimed by King Pavariya. Baka, hearing of this, wished to fight Pavariya, but they agreed to compromise, and from that time Pancapapa lived for a week at a time in the house of each king. The monk just wanted to tell people to do good deeds willingly/happily...or the merit might not be so good. but, on first sight, she had looked angrily at him. ...but still...and my family always says 'not very Buddhist of you' whenever I do, which makes it even more annoying. Which I would tell mine... Didn't Jesus say to turn the other cheek? Why would anyone be insulted by someone else's anger? And, if someones is angry they are already unhappy. I will take that as a positive, but still that is one ugly cat! I do that a bit. I got told as a kid that it takes no brains & even less effort to keep your mouth shut. This habit has undoubtedly saved me from making a million apologys. ... Didn't Jesus say to turn the other cheek? So Jesus said this did he? Is this the same Jesus that took a stick to the loan sharks, gamblers & dealers at the temple. I think if we're honest, we all get angry at times. As long as we don't let the whole world know we're angry it's not too bad & for our own sake don't carry it too long. If Jesus can get angry so can I. After death...Princess Rohini was reborn into the Tavatimsa Heaven...she was the most beautiful angel that 4 devas quarreled because of her...the case went to Sakka to judge , who she should be with???? Angry is empty. So I get angry all the time. LastLegend wrote: Angry is empty. So I get angry all the time. reddust wrote: , "My motto is, "When in Doubt, do nothing"......that is keep my mouth"
I do that a bit. I got told as a kid that it takes no brains & even less effort to keep your mouth shut. This habit has undoubtedly saved me from making a million apologys.. When I get angry, I feel a burning sensation in my head. Then after my anger subdued, I am empty again. The Vietnamese translation of suffering is "phiền nảo." Phiền literally means bothering nảo means brain. Vietnamese, "Phiền nảo tức bồ đề" which means "suffering is bodhi." 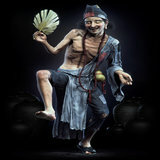 LastLegend wrote: Vietnamese, "Phiền nảo tức bồ đề" which means "suffering is bodhi." Bodhi is an abstract noun formed from the verbal root budh (to awake, become aware, notice, know or understand) corresponding to the verbs bujjhati (Pāli) and bodhati or budhyate (Sanskrit). Also from the same root are the Sanskrit words bodha (also meaning knowledge or intelligence) and buddhi which is the exact equivalent to the Greek word nous.